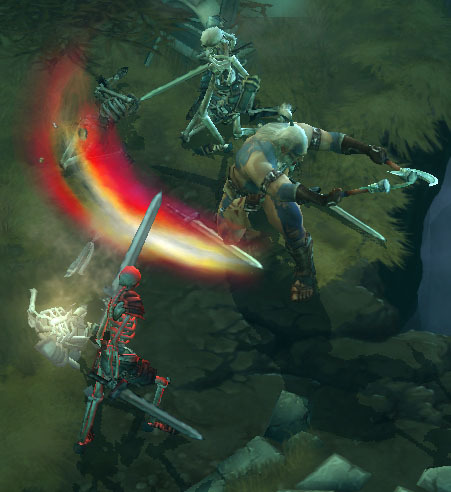 Our Diablo III Forums have been buzzing ever since Gamescom, and the activity only picked up with the recent info skill changes and the end game. A survey of the most-contentious topics of the past week. Level Cap at 60 has more than 150 replies, Big Gem Changes has over 120, Only 7 Skills: Good or Bad? has is over 100 replies, The End Game is over 60, and there are lots of other busy threads on related topics. There’s more to talk about than that, of course. Your favourite D3 changes/improvements? is a thread that does what the title says. Read and enjoy, though beware; you may find it odd to see a whole thread without angry denunciations of um… everything. Predict the fifth character threads have been few and far between, (though they’ll pick up closer to the BlizzCon announcement) since everyone assumes we’ll see an archer/rogue/ranger of some type. There are some different takes on the issue, though. Some fans are speculating about the character’s likely ethnic identity, while a brand new thread is trying to imagine the type of resource that would work best for an archer class. There’s a small debate about whether a new screenshot shows the red target outline, or if it’s an example of colored light sourcing from the Barbarian’s Cleave. Take a look and see what you think. Finally, the battleground that is the Terrible Graphics thread continues to grind on inexorably and irresistibly. It’s now past 515 posts, and has become the most-viewed (15,000+) non-sticky thread in that forum’s history.